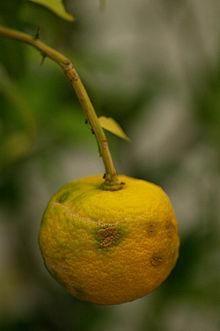 The yuzu is a citrus fruit and plant. It originated in East Asia. The fruit looks like a rough grapefruit, and changes colour from green to yellow when it becomes more ripe. The yuzu is often used in Japanese and Korean cuisine. It appears much like a lemon but tastes more like a floral lime. This page was last changed on 4 September 2018, at 18:00.